you want to make less cookies or brownies. This Recipe Makes Moist Cake-Like Brownies AND Delicious Cookies, Too! Preheat oven to 375 degrees. Lightly grease cookie sheets. Preheat oven to 350 degrees. Lightly grease 17 x 11 inch baking pan for the brownies, or 2 smaller pans. Sift together the flours, cocoa, and baking soda. Stir dry mixture well to evenly distribute ingredients. Set aside. Soften butter in microwave. (About 30 seconds) Grate or shred zucchini (by hand or with a food processor) to create one full cup. Combine butter, zucchini, white sugar, and brown sugar. Mix well. Add eggs and vanilla extract; blend well. Add dry flour mixture to the liquid mixture, and stir until all the flour has been absorbed. Mixture will become thick. Add chocolate chips and walnuts if desired. Shape dough into small balls, and place 2 inches apart on lightly greased cookie sheets. Flatten slightly with your hand or the bottom of a glass. You can make these cookies any size you desire. Bake for 12-15 minutes. Spread evenly into lightly greased 17 x 11 inch pan, OR divide batter into two smaller pans: ONE 9 x 13 inch pan AND ONE 9 x 9 inch pan. Bake 20-30 minutes, or until brownies have set and start to pull away from sides of pan. 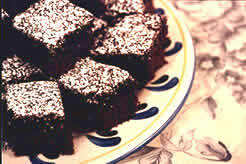 After cookies or brownies have cooled completely, frost if desired or top with a dusting of powdered sugar. ENJOY! You will NOT be able to detect the taste of zucchini in the finished product! Only moist, rich, chocolatey cookies and brownies! No zucchini in the house? Substitute applesauce instead! You can freeze unused dough and defrost and bake later...for a special treat. This dough also keeps well in the refrigerator for up to a week. This recipe makes about 8 dozen cookies. Cut the recipe in half. Put half the dough in the freezer and save for later. 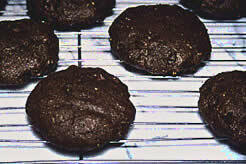 Allow cookies and brownies to cool COMPLETELY BEFORE covering with plastic or placing in plastic containers with lids. Covering too soon will cause water vapor to condense inside your bags or containers...making your baked goods soggy!